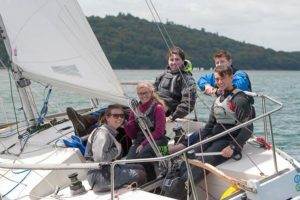 This year we are starting up an Under 25’s Keelboat academy in the Club, Primarily we will be using the clubs 1720 for training, learning boat maintenance and tuning for Keelboats. There will also be opportunities to go to events around the country representing the Club on other boats like J24’s and J80’s. We have been invited to put in a team for the ICRA Nationals in Galway August 15th -18th, to race against 6 other U25 teams from around the country, we will also be looking at putting teams in for some match racing events as well as the Wave regatta in Howth YC, Volvo Cork Week, 1720 Nationals and Europeans. We would like to get this up and running as soon as possible so please get in touch if you are interested in this exciting new challenge. Please share this with anyone you feel might be interested.